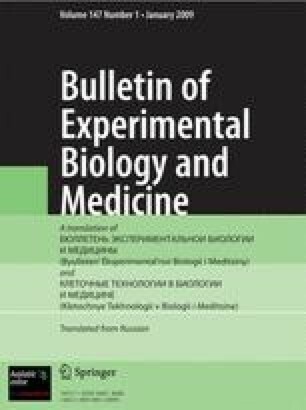 Automatic activity of pacemaker cells with slow diastolic depolarization was found by means of a microelectrode technique in the cusps of the atrioventricular valves taken from the hearts of 34 rabbits. Electrophysiological characteristics of the action potentials of these cells were studied. Inhibitors of the slow sodium-calcium channel (Mn++, Co++, and Mg++ ions) were found to abolish automatic activity of the pacemaker cells, whereas a three- to fourfold decrease in the potassium ion concentration in the perfusion solution did not depress it. The automatic activity of the pacemaker cells of the atrioventricular valves is considered to be due to the function of the slow sodium-calcium channel. Laboratory of Experimental Cardiology, P. K. Anokhin Institute of Normal Physiology, Academy of Medical Sciences of the USSR, Moscow. (Presented by Academician of the Academy of Medical Sciences of the USSR A. M. Chernukh.) Translated from Byulleten' Éksperimental'noi Biologii i Meditsiny, Vol. 81, No. 5, pp. 517–520, May, 1976.